1: Scalable Description Coding (SDC) decreases the number of transmitted descriptions by creating a Scalable Description composed of a number of higher layer SVC sections. This mechanism reduces the level of lower layer error resilience, thus reducing transmission costs. Resilience is reintroduced to the stream by offering a Network Coding option, as wall as a Redundancy Description. 2: Adaptive Layer Distribution (ALD) increases the number of descriptions being transmitted whilst reducing the transmission cost of each description. Both SDC and ALD can be seen as hybrid streaming models since they incorporate elements of layered coding, such as prioritised hierarchy, into a description-based model. Thus it leverages the best of both adaptive streaming models to optimise error resiliency without sacrificing user-perceived quality. 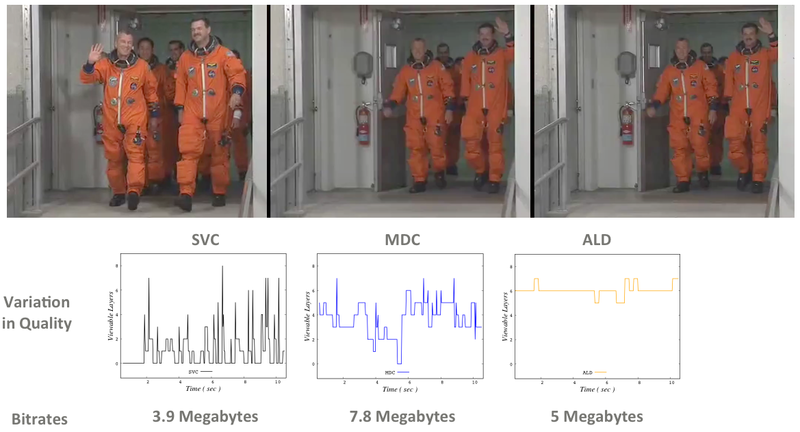 Subjective testing confirms that SDC shows a noticeable improvement compared to conventional Multiple Description Coding (MDC) in terms of bandwidth requirements, without sacrificing user-perceived quality. We believe that SDC is especially significant for mobile networks where bandwidth over-the-air and in the backhaul continue to be insufficient to satisfy the growing demand of video applications. SDC yields upwards of 25% bandwidth savings over MDC and also delivers higher quality streams for longer periods of time. Development partners are sought to progress this technology towards commercialisation via licensing routes. 1: Better use of available bandwidth: SDC reduces the number of descriptions required and thus offers greater opportunity for better use of the available bandwidth. In the case of four-layer coding the number of descriptions transmitted over the network is reduced from four to three, thus yielding bandwidth savings of 25% over MDC. Increased savings can be achieved with SVC streams with more layers. 2: Boosted transmission efficiency: SDC can be further improved by optimising the ordered transmission of its descriptions. Priority descriptions are transmitted first, thereby increasing the time available for retransmitting important descriptions and for the receiving device to infer its ongoing requirements based on the descriptions received so far. This technique can yield up to a 35% reduction in processed bytes by eliminating the need for decoding the redundant SDC description. The images below show the number of viewable layers for conventional SVC, conventional MDC and the ALD proposition for GOP=1 (upper) and GOP=8 (lower). Download MP3 movies for GOP=8 here. Conventional techniques to optimise the quality and reliability of video send over lossly network include Scalable Video Coding (SVC) and Multiple Description Coding (MDC). The former allows devices to dynamically modify their stream quality by moderating image quality according to changes in the achieveable network throughput. This is achieved by partitioning the video stream into several subsets, commonly called layers, whereby the cumulative receipt of additional layers offers a progressively higher quality. A serious limitation of SVC is that the loss of a lower layer hinders the device from decoding the dependent higher layer. Hence, Multiple Description Coding (MDC) offers an improved error resiliency to packet loss, but at the cost of increased data rates due to redundancy techniques, such as forward error correction (FEC), as in MDC-FEC. SDC enhances MDC-FEC, henceforth referred to as MDC, with a novel transmission scheme to achieve lower data rates withour sacrificing user-perceived quality. The schema operates by redefining the MDC description prior to transmission, to reduce the required bandwidth. 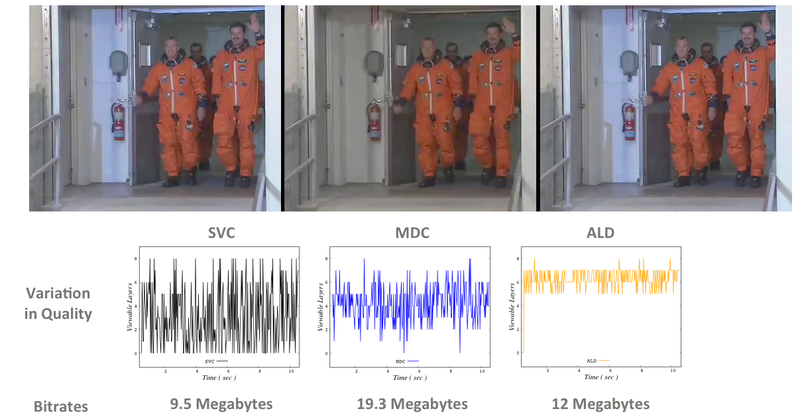 Compared to MDC, SDC improves the user-perceived quality with lower bandwidth usage levels, while offering increased robustness against packet loss. The design of Scalable Description Coding (SDC) aspires to reduce the transmission cost of MDC by reallocating a subset of the enhanced layer sections to a new scalable description prior to transmission. Hence, SDC decreases the number of N descriptions required to decode a media stream, while maintaining the level of stream quality received by the user. This is achieved by reallocating pre-FEC original sections, so as to reduce FEC redundant replication and thus the number of transmitted descriptions. ALD provides a means of increasing the number of descriptions being transmitted, whilst reducing the transmission cost of each description. This technique provides an adaptive mechanism to determine the optimal byte allocation of each description, thus reducing the byte-size of each error resilient SVC section and overall transmission cost. Furthermore, UCC has developed an intelligent packetisation model by which stream quality is directly proportional to the level of packet loss in the transmission network, thus realising the overall goal of layered coding. This option provides consistency in the overall stream quality. Finally, ADL incorporates a low byte-cost error resilience model by which stream quality can be increased to maximise stream quality, even in the presence of low levels of network loss. Quinlan, J.; Zahran, A.; Sreenan, C., "SDC: Scalable description coding for adaptive streaming media," Packet Video Workshop (PV), 2012 19th International , vol., no., pp.59,64, 10-11 May 2012. Jason J. Quinlan, Ahmed H. Zahran, and Cormac J. Sreenan. 2013. ALD: adaptive layer distribution for scalable video. In Proceedings of the 4th ACM Multimedia Systems Conference (MMSys '13). ACM, New York, NY, USA, 202-213.